If dense strategy isn't your thing, then maybe the dense action promised today's other big release is. 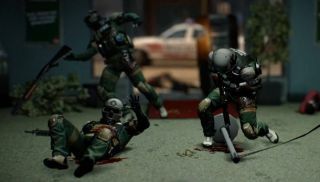 Payday 2, the sequel to Overkill's criminal spin on Left 4 Dead style co-op, is out now. To mark the occasion, here's a launch trailer that sweeps through a single moment of chaotic heisting. Of course, being frozen in time, what you don't get is the near-incomprehensible shrieking of your friends as your carefully laid plans fall apart. Payday 2 is available through Steam for £24.99/$29.99.